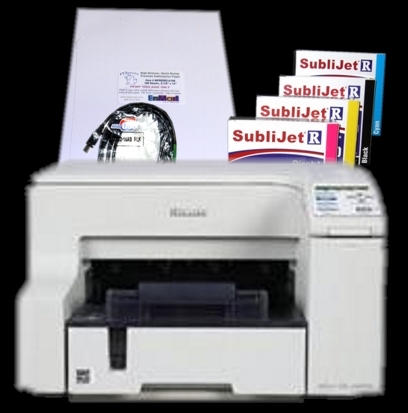 The Ricoh GX e3300N Printer for Sublimation » Embroidery Talk Has Moved! This entry was posted on Tuesday, February 9th, 2010 at 4:40 pm and is filed under Sublimation. You can follow any responses to this entry through the RSS 2.0 feed. Both comments and pings are currently closed. How many sheets of paper 8.5 x 11 come with the offer above? There is now a driver and profile avaialable for this printer if you use a Mac. Do you have this available yet included in the purchase price? Are there specialty printers for dye sublimation work? I don’t know about specialty printers, but Sawgrass only makes sublimation ink for certain makes and models of printers. Currently, they offer ink for the Epson WorkForce 30, 1400, 1900 and 4880. They also make ink for the Ricoh 3300, 5050 and 7000. It is 100 sheets of paper. I am not aware of a Mac profile and driver for the GX e3300N. If there is one available, it most likely could be downloaded from the Sawgrass website. The downloads are free.